Large flowers in bright, bold colors make gerbera daisy (Gerbera jamesonii) a show-stopper in garden displays. Also called Barberton daisy, African daisy and Transvaal daisy, gerbera daisy is perennial outdoors in U.S. Department of Agriculture plant hardiness zones 9 through 11 but is often grown as an annual. It also grows well indoors. A gerbera daisy plant performs best in well-drained soil that is rich in organic matter and in a full-sun site, but it needs afternoon shade in a hot climate. An outdoor gerbera daisy needs regular feeding to flower well, but it should be watered infrequently to avoid crown rot. Feed your gerbera daisy with a water-soluble, 24-8-16 fertilizer diluted at a rate of 1 tablespoon per 1 gallon of water, which feeds 10 square feet of plants. Apply the solution every two weeks while the gerbera daisy flowers, or dilute and apply the fertilizer according to the instructions on its label. In wet conditions, gerbera daisy suffers from crown rot, which affects its base. Help your plant avoid that disease by watering your gerbera daisy when its soil is dry to a depth of 1 inch. 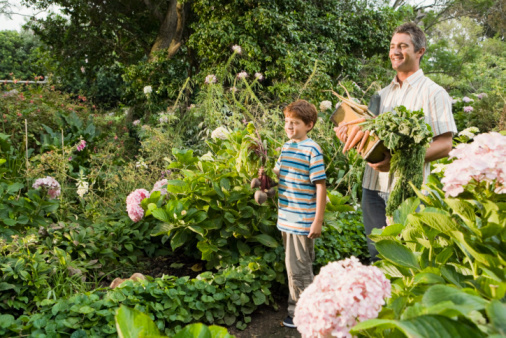 If you water and feed the plant at the same time, then apply the fertilizer first. Don't apply only fertilizer if the ground is dry. Feed and water the gerbera at the plant's base, and never from above, to help avoid leaf diseases. Deadheading encourages a gerbera daisy plant to produce more flowers, and dividing an outdoor plant helps keep it healthy. Deadheading, which is removing flowers as they fade, improves the plant's appearance and encourages a long blooming period. 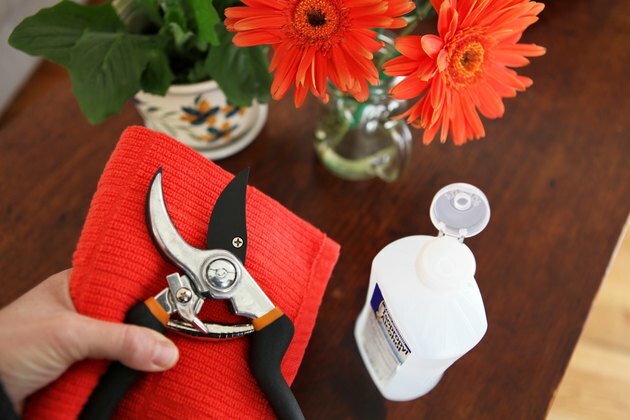 Wipe pruning shear blades with rubbing alcohol, and use the tool to prune fading flowers at their stem bases. Sterilizing the pruning shears again is necessary after you finish pruning. If you grow your outdoor gerbera daisy as a perennial, lift and divide it in the spring of the plant's third year. Do so by pushing a garden fork into the soil about 4 inches from the plant's base, and gently lever the plant out of its soil. Pull the plant's base into three or four equal sections, and plant the sections 1 foot apart and about 1/2 inch higher than the original growing depth. Aphids, mites, thrips and whiteflies attack gerbera daisy, and the plant also suffers from leaf spots, rots and viruses. Aphids are small insects that cluster at shoot tips and on the undersides of leaves. Mites look like tiny moving dots, and thrips are tiny, very slim insects. 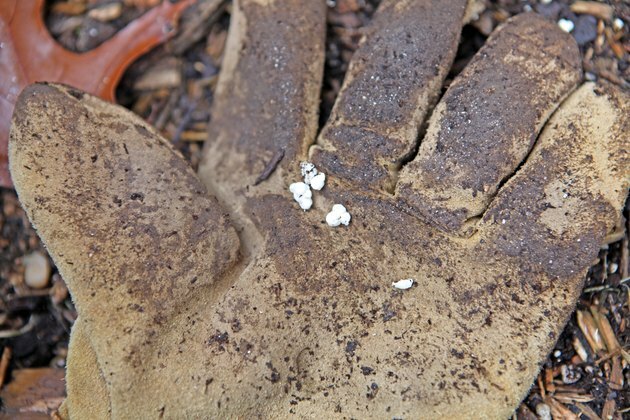 Whiteflies are small, white, flying insects. Favorable growing conditions and good-quality care are the gerbera daisy's best defenses against pests and diseases, and you also can control minor problems by pinching off affected shoots. 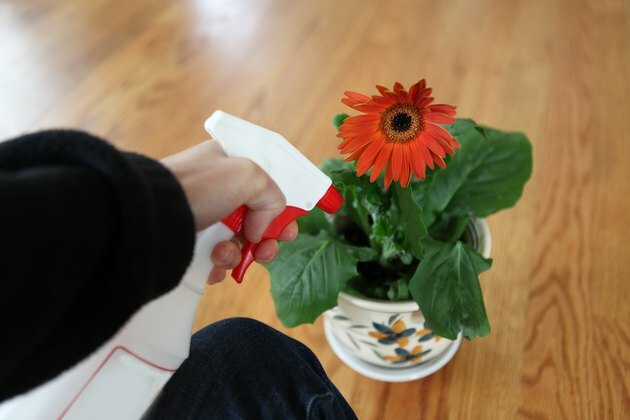 On a cloudy day, spray an outdoor gerbera daisy heavily infested with pests with a ready-to-use insecticidal soap containing 1 percent potassium salts of fatty acids. This spray also can be used on an indoor gerbera daisy. Spray the plant once each week as needed, covering all its foliage but avoiding its flowers. Dig up an outdoor gerbera daisy heavily infested with leaf spots, rots or viruses, and put it in the trash. 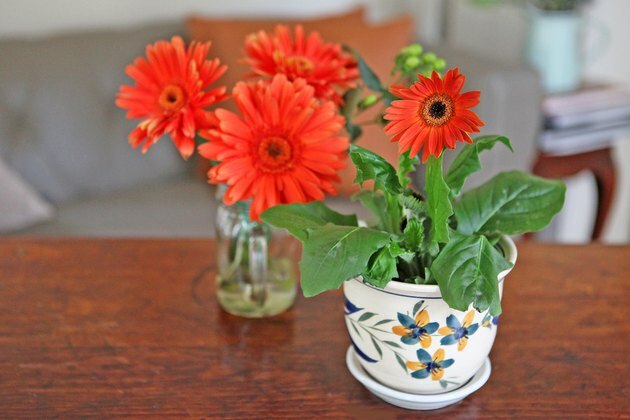 Gerbera daisy can grow well as an indoor plant for two to three years. Grow your gerbera daisy in a peat moss-based potting compost in a container with bottom drainage holes and a drip tray. Place the container in a bright spot that receives no more than one to two hours of direct sunlight each day, and water the plant when its potting compost is dry to a depth of 1 1/2 inches. 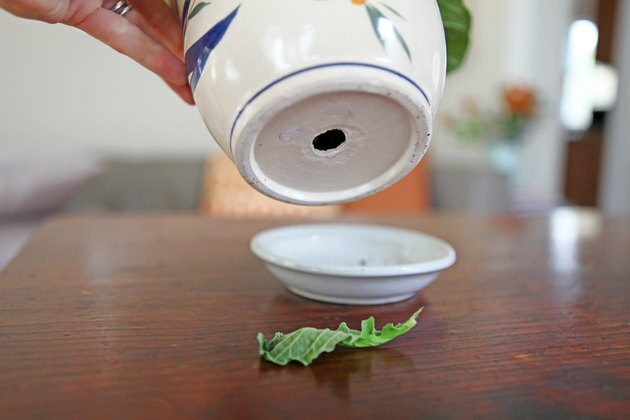 Allow that material to drain thoroughly before returning the container to its drip tray. Keep the plant's location at 40 to 70 degrees Fahrenheit while the plant is in flower, and feed the gerbera daisy every two weeks with a liquid 24-8-16 fertilizer diluted at a rate of 1/2 teaspoon per 1 gallon of water. You can replace water with the fertilizer solution if the plant needs watering. Pour the solution slowly onto the potting compost surface until it runs out of the plant container's drainage holes, and allow the plant to drain thoroughly before putting the container back on its drip tray.